Research has established that alcohol advertising,1 2 3 like that for tobacco4 and fast food,5 6 7 influences behaviour. It encourages young people to drink alcohol sooner and in greater quantities. From a public health perspective, advertising of alcohol should clearly be limited. The United Kingdom has opted for a system of self regulatory controls that focuses primarily on the content of advertisements, with some limitations on the channels that can be used. This is overseen by the Advertising Standards Authority, through the Committee of Advertising Practice, which represents the interests of advertisers, agencies, and media owners. As part of its alcohol inquiry, the House of Commons health select committee wanted to explore the success of self regulation. It obtained a large number of internal marketing documents from alcohol producers and their communications agencies in order to examine the thinking and strategic planning that underpin alcohol advertising and hence show not just what advertisers are saying, but why they are saying it. Here we present the key insights to emerge. Because alcohol advertising is so extensive (around £800m (€900m; $1.3bn) a year)8 it was not possible to examine documents from all relevant companies. Requests were therefore sent to only four producers, chosen for their profile, and their respective communications agencies; and they were asked to send documents relating to just five brands out of the dozens on their books for 2005-8 (table 1⇓). We analysed the documents on behalf of the committee. Although the sample is small, the requests resulted in thousands of pages of paper documents and nearly three gigabytes of electronic ones. These comprised contact reports between client and agency, client briefs, creative briefs, media briefs, media schedules, advertising budgets, and market research reports (box 1). Links to the marketing strategy—Communications of all sorts have to fit in with the rest of the marketing strategy, especially product formulation, pricing, and distribution. We conducted a thematic analysis of the documents. We initially looked at four themes that are banned by the advertising code of practice (box 2) as well as sponsorship and new media. Young people and the next generation—Advertisements must not appeal strongly to people under 18 or be associated with, or reflect, youth culture and no-one who is, or appears to be, under 25 years old may play a significant role in advertisements. University students are another focus. A Smirnoff presentation says, a “great place to create excitement and drive recruitment is within the student community,”w12 and Carling wanted a “greater focus on students as a core recruitment audience.” Carling’s aim turned into a proposal to produce a magazine for first year students—including those at Scottish universities, where a significant proportion of freshers are under the legal drinking age. Advertisers are well aware that some groups drink irresponsibly. Brand strategy documents and campaign briefs abound with references to unwise and immoderate drinking.w14-w16 Far from regretting or avoiding any promotion of this behaviour as the codes require, producers and agencies analyse it for market opportunities. 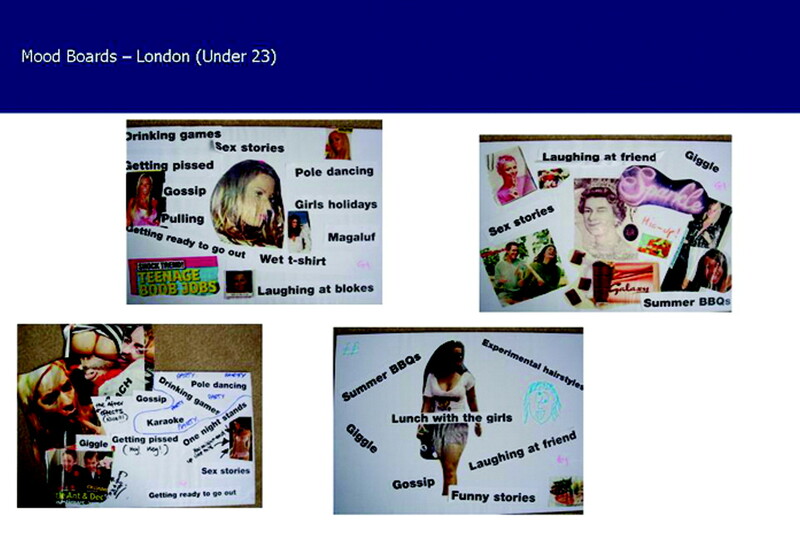 Thus Lambrini’s qualitative research with young women provided respondents with stimulus themes such as “getting pissed,” “one night stands,” and “drinking games” to help them discuss their experiences with the product (fig 1⇓). Increasing consumption is a key promotional aim, contradicting the claim that the intention is simply to encourage brand switching (box 3). Suggesting that alcohol can enhance either masculinity or femininity is proscribed, yet the documents are full of references to both. Thus the need to “communicate maleness and personality”w28 is noted as a key communications objective for WKD, and Diageo highlights the brand values and personality of Smirnoff Black as “urbane,” “masculine,” and “charismatic”; dictionary definitions of these characteristics are accompanied by photographs of George Clooney, Bono, and Ewan McGregor.w29 Masculinity is often equated with drinking too much (as in the Carling commandments, which include “Thou shalt never desert thy mates in drunken distress” and “Thou shalt never miss a round”w30), alcoholic strength (“potency is a key area to delivering masculinity”w31), and bravado (as with Sidekick’s “Kick starting the night . . . macho competitiveness . . . how much can you take?”w32). Sponsorship is not explicitly covered by the codes, so producers can take advantage of the resulting regulatory ambiguity, as box 4 shows. Digital media—including social networking sites, email, viral marketing, and texts—are a fast growing channel for alcohol advertising. They offer advertisers interactivity and increased creative freedom and are less regulated than traditional media. For example, the only control on access to alcohol related sites is the need for the user to provide an adult date of birth, which is easily side stepped. Furthermore, viral marketing campaigns are designed to encourage young people to pass on messages to their friends, with no means of controlling who receives them. The aim is to gain credibility by making it seem as if the message is from a trustworthy friend (“It should look like it’s come from your mate, but is infact [sic] Carling branded”w41). Similarly, campaigns promoting girls dancing the “Lambrini” have resulted in many self filmed imitations—often featuring girls who appear to be under the legal drinking age—being posted on the company’s and various social networking sites. The documents we analysed show that attempts to control the content of alcohol advertising have two systemic failings. Firstly, the sophisticated communications and subtle emotional concepts such as sociability and masculinity that comprise modern advertising (and sponsorship) often defy intelligent analysis by the regulator, especially when the thinking and strategising that underpins them remain hidden (box 5). Secondly, producers and agencies can exploit the ambiguities in the codes and push the boundaries of both acceptability and adjudication. The second problem of pushing the boundaries is illustrated by Lambrini’s tenacious attempts to retain the strapline “Girls just wanna have fun” in the face of repeated advice from the regulator that it was “targeting young girls, and promotes getting pissed” and was “unacceptable.”w46 Only when the strapline appeared in newspaper coverage of the death of a young woman in an incident that occurred after she had been drinking Lambrini did the company consider disassociating themselves with it. The UK needs to tighten both the procedures and scope of the regulation of alcohol advertising. In terms of procedures, regulation should be independent of the alcohol and advertising industries, matching best practice in other fields such as financial services and professional conduct. In addition, young people should be formally involved in the process—the best people to judge what a particular communication is saying are those in the target audience. Finally, all alcohol advertisements should be vetted, not, as at present, just those for broadcast. Turning to scope, sponsorship must be covered by the regulations, and digital media should also come under much greater scrutiny. In addition, particular efforts should be made to protect children from alcohol advertising (box 6). The current problems with UK alcohol promotion are reminiscent of those seen before tobacco advertising was banned, when attempts to control content and adjust targeting simply resulted in more cryptic and imaginative campaigns. Indeed David Abbott, a leading advertiser of the time, argued that the codes were in fact acting as a stimulus, not a constraint, on creative imagination and that the only solution was an outright ban. History suggests that alcohol advertisers are, appropriately enough, drinking in the last chance saloon. Contributors and sources: The authors all have a long term research interest in examining critically the role of marketing in society. Previous work has included systematic reviews of the impact of food marketing (GH, MS) and alcohol advertising (GH, KA) on children, most notably through a large NPRI grant. OB is currently studying alcohol cultures and new media, while TA and TF have an interest in business ethics and regulation. Funding: This work was supported by a grant from the Alcohol Education Research Council. Anderson P, de Bruijn A, Angus K, Gordon R, Hastings G. Impact of alcohol advertising and media exposure on adolescent alcohol use: a systematic review of longitudinal studies. Alcohol Alcoholism2009;44:229-43. Booth A, Meier T, Stockwell T, Sutton A, Wilkinson A, Wong R, et al. Independent review of the effects of alcohol pricing and promotion. Part A: systematic reviews. project report for the Department of Health, September 2008. www.dh.gov.uk/prod_consum_dh/groups/dh_digitalassets/documents/digitalasset/dh_091366.pdf. Smith LA, Foxcroft DR. The effect of alcohol advertising, marketing and portrayal on drinking behaviour in young people: systematic review of prospective cohort studies. BMC Public Health2009;9:51. Lovato C, Linn G, Stead LF, Best A. Impact of tobacco advertising and promotion on increasing adolescent smoking behaviours. Cochrane Database Syst Rev2003;(4):CD003439. Hastings GB, Stead M, McDermott L, Forsyth A, MacKintosh AM, Rayner M, et al. Review of research on the effects of food promotion to children—final report and appendices. 2003 www.food.gov.uk/news/newsarchive/2003/sep/promote. Institute of Medicine. Food marketing to children and youth: threat or opportunity?Washington, DC: Institute of Medicine of the National Academies, 2006. Cairns G, Angus K, Hastings G. The extent, nature and effects of food promotion to children: a review of the evidence to December 2008. Geneva: WHO, 2009. Cabinet Office. Strategy unit alcohol harm reduction project: interim analytical report. 2003:129. www.cabinetoffice.gov.uk/media/cabinetoffice/strategy/assets/su%20interim_report2.pdf.